The backup copy job runs continuously, in cycles. By default, a new backup copy cycle begins every day; however, you can specify any time interval needed. At the beginning of every backup copy interval, Veeam Backup & Replication checks the source backup repository: if a new restore point has been added to the primary backup chain, Veeam Backup & Replication automatically copies it to the target backup repository. After that, the backup copy job is put on hold until a new backup copy interval begins, and a new point appears on the source backup repository. This section describes only basic steps that you must take to create a backup copy job. 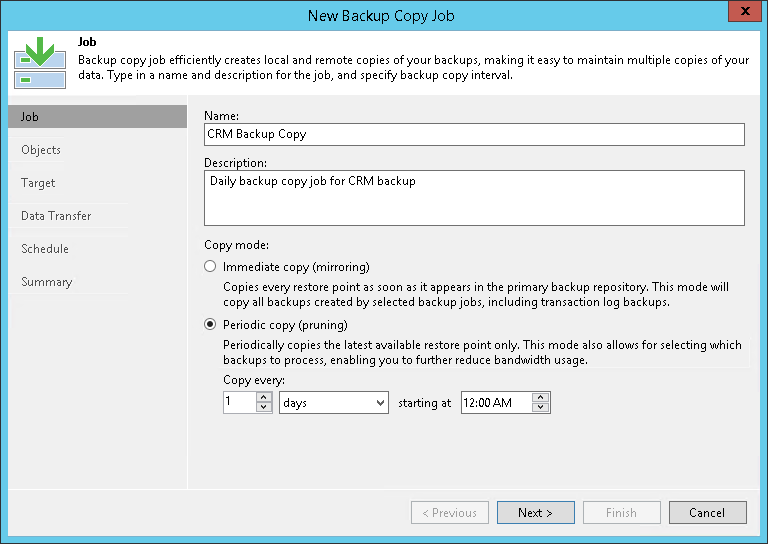 To get a detailed description of all backup copy job settings, see the Creating Backup Copy Jobs section in the Veeam Backup & Replication User Guide. 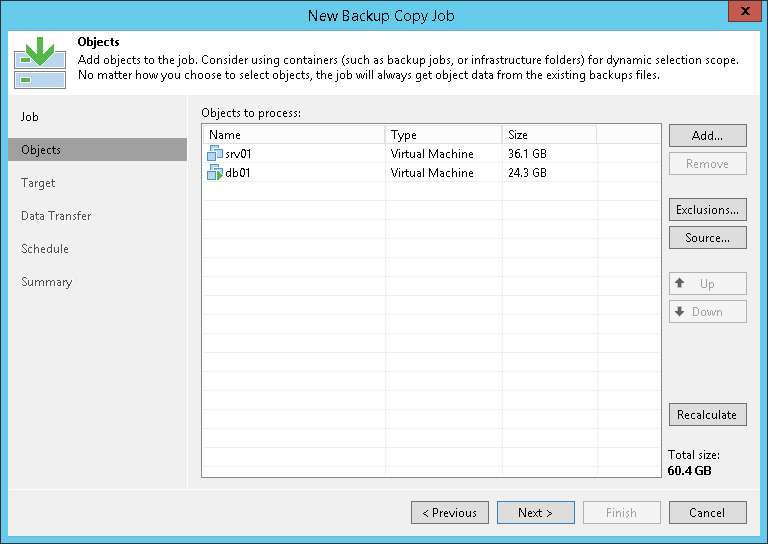 On the Home tab, click Backup Copy and select Virtual machine > VMware vSphere or Virtual machine > Microsoft Hyper-V.
At the Job step of the wizard, specify a name and description for the backup copy job. In the Copy every field, specify the time interval according to which the synchronization process must start. Veeam Backup & Replication will check if new restore points are available in the source backup repository. If a new restore point is found, it will be copied to the target backup repository within the synchronization interval. At the Objects step of the wizard, click Add and select VMs or physical machines whose restore points you want to copy from the local backup repository to the cloud repository. To quickly find the necessary object, use the search field at the bottom of the Add Objects window. If you want to exclude VMs from the VM container from the job, click Exclusions and specify what objects you want to exclude. At the Target step of the wizard, from the Backup repository list, select the cloud repository to which you want to copy the VM backup. To use the GFS (Grandfather-Father-Son) retention scheme, select the Keep the following restore points as full backups for archival purposes check box. In the fields below, define the number of daily, weekly, monthly, quarterly and yearly full intervals for which backups must be retained. It is recommended that you enable GFS retention settings for the backup copy job if the SP has enabled the deleted backups protection option in the properties of your tenant account. This way, Veeam Backup & Replication will be able to protect backups created by the job against an attack when a hacker reduces the job's retention policy and creates a few incremental backups to remove backed-up data from the backup chain. If you do not enable GFS retention settings for the backup copy job, the job will complete with a warning. 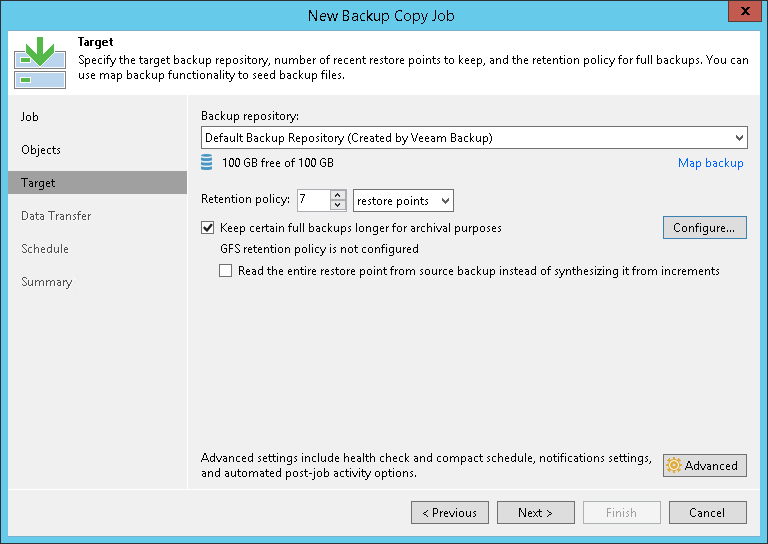 In the job statistics window, Veeam Backup & Replication will display a notification advising to use the GFS retention scheme for the job. The warning is displayed only if the tenant backup server runs Veeam Backup & Replication 9.5 Update 3 or later. In earlier versions of Veeam Backup & Replication, the warning will not be displayed, and the backup copy job will complete in the Success state. To encrypt the resulting backup file on the cloud repository, click Advanced. On the Storage tab, select the Enable backup file encryption check box. From the Password field, select a password that you want to use to encrypt the backup file. If you have not created a password beforehand, click Add or use the Manage passwords link to specify a new password. At the Schedule step of the wizard, define the time span in which the backup copy job must not transport data over the network. You can use this option, for example, to disable the backup copy job during production hours not to produce workload on the production environment.